Jacinta: Well, we need an antidote to all that theological hocus-pocus, so how about a bit of fundamental science for dummies? Canto: Sounds great, I just happened to read today that there are three great questions, or areas of exploration for fundamental science. The origin of the universe – and its composition, including weird black holes, dark matter and dark energy – that’s one. The others are the origin of life and the origin of consciousness. Take your pick. Jacinta: I’ll choose life thanks. Jacinta: Isn’t it still doing that? Canto: Well, yes of course. An interesting study conducted a few years ago found that around 54% of the heat welling up from within the earth is radiogenic, meaning that it results from radioactive decay of elements like radium and thorium. The rest is primordial heat from the time of the planet’s coalescing into a big ball of matter. Jacinta: You say three and a half billion years or more – can you be a bit more specific? Are we able to home in on the where and the when of life’s origin on this planet? Canto: Well, that would be the pot of gold, to locate the place and time of the first homeostatic replicators, to wind back history to actually witness that emergence, but I suspect there would be nothing to actually see, at least not on the time-scale of a human life. I think it’d be like the emergence of human language, only slower. You’d have to compress time somehow to witness it. Jacinta: Fair enough, or maybe not, it seems to me that the distinction between the animate and the inanimate would be pretty clear-cut, but anyway presumably scientists have a time-frame on this emergence. What allows them to date it back to a specific time? Canto: Well, it’s an ongoing process of honing the techniques and discovering more bits of evidence, a bit like what has happened with defining the age of our universe. For example, you’ve heard of stromatolites? Jacinta: Yes, those funny black piles that stick out of the water and sand, somewhere in Western Australia? They’re made from really old fossilised cyanobacteria, right? Jacinta: But hang on, these stromatolites, they say they’re really old, like more than 3 billion years, but how do they know that? As Bill Bryson would say. Canto: Well, good question Jass, in fact it’s highly relevant to this Greenland discovery so let me talk about radiometric dating, using this example. Greenland has been attracting attention since the sixties as a potential mineral and mining resource, so the Danish Geological Survey was having a look-see around the region of Nuuk, the capital, in the south-west of the island. The principal geologist found ten successive layers of rock in the area, using standard stratigraphic techniques that you can find online, though they’re not always easy to apply, as strata are rarely neatly horizontal, what with crustal movements, fault-lines and rockfalls and erosion and such. Anyway, it was his educated guess that the bottom of these layers was extremely old, so he sent a sample to Oxford, to an expert in radiometric dating there. This was in about 1970. Jacinta: And doesn’t it have to do with radioactive isotopes and half-lives and such? Canto: Absolutely. Take uranium 238, which if you’ve been watching the excellent recent ABC documentary you’ll know that it decays through a whole chain of, from memory, twelve nuclides before stabilising as an isotope of lead. That decay has a half-life of 4.5 billion years – longer than the life of this planet, or at least the life of its crust. So it’s a matter of measuring the ratio of isotopes, to see how much of the natural uranium has decayed. In this case, the gneiss, the piece of bottom-strata rock that was analysed, had the highest proportion of lead in it of any naturally occurring rock ever discovered. Jacinta: So that means it’s likely the oldest rock? Aw, I thought Australia had the oldest. This is terrible news. Jacinta: Right, so that might be pushing the age of life back a few hundred million years, if it can be verified, but it still doesn’t answer the how question..
Canto: Oh, nowhere near it, but I’ve just started mate. May I continue? Not surprisingly this region is now seen as a treasure trove for those hunting out the first life forms and trying to work out how life began. 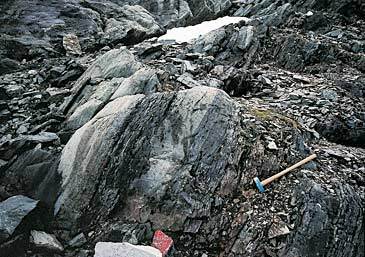 It was soon found that the Isua greenstone to the north of Nuuk contains carbon with a scientifically exciting isotopic ratio. The level of carbon 13 was unexpectedly low. This is generally an indication of the presence of organic material. Photosynthesising organisms prefer the lighter carbon 12 isotope, which they capture from atmospheric or oceanic carbon dioxide. But the finding’s controversial. Many are skeptical because this is the period known as the ‘late heavy bombardment’, with asteroids crashing and smashing and vaporising and possibly even sterilising… and they haven’t discovered any fossils. Jacinta: So, photosynthesis, that’s what created the great oxygenation, which created an atmosphere for complex oxygen-dependent organisms, is that right? Jacinta: Okay, fine, but couldn’t one of those asteroids have brought life here, or proto-life, or the last essential ingredient…? Jacinta: Which isn’t an adequate explanation at all, because where did that life come from? I want to know how any life-form anywhere can spring from the inanimate. It is often said that all the conditions for the first production of a living organism are now present, which could ever have been present.— But if (& oh what a big if) we could conceive in some warm little pond with all sorts of ammonia & phosphoric salts,—light, heat, electricity &c present, that a protein compound was chemically formed, ready to undergo still more complex changes, at the present day such matter wd be instantly devoured, or absorbed, which would not have been the case before living creatures were formed. Now this was pretty damn good speculation for the time, and a couple of generations later two biologists, Aleksandr Oparin of Russia and John Haldane of England, independently developed a hypothesis that built on Darwin’s ideas. Jacinta: Oh yes, they had this idea that if you added a bit of lightning to the early terrestrial atmosphere, which was full of ammonia or something, you’d get a lot of organic chemistry happening. Canto: Well I think the ‘or something’ part is true there – their idea was that there was a lot of hydrogen, methane and water vapour in the early atmosphere, and that, combined with local heat caused perhaps by lightning, or volcanic activity or some sort of concentrated solar radiation, the combo created a soup of organic compounds, out of which somehow over time emerged a primordial replicator. Jacinta: So far, so vague. Jacinta: Okay so you’ve more or less succeeded in dissolving the boundary between the animate and the inanimate before my eyes, but it’s still pretty vague on the details. Canto: In 1953, Stanley Miller took up the challenge of his supervisor, famous Nobel Prize-winning biologist Harold Urey, who noted that nobody had tested the Oparin-Haldane hypothesis experimentally. 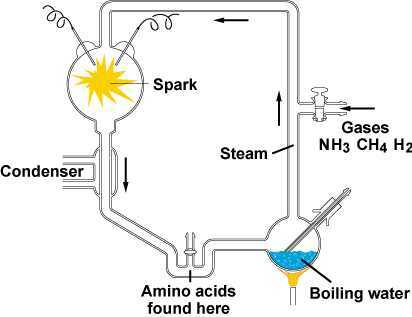 Miller created a mini-atmosphere in a bottle, using methane (CH4), hydrogen, water vapour and ammonia (NH3), and after sparking it up for a while, he managed, to the amazement of all, to produce amino acids, the building blocks of proteins. Surely the first step in producing life itself. Jacinta: Ah yes, that was a famous experiment, but didn’t it turn out to be something of a dead end? Canto: Well, yes and no. It has been replicated with different mixtures and ratios of gases, and amino acids, sugars and even traces of nucleic acids have been generated, but nothing that could be described as a primordial replicator. But of course this work has got a lot of biologists thinking. Jacinta: But this was 60 years ago. That’s a lot of thought without much action. Jacinta: Or a pumpkin, or Nan’s rhubarb pie..
Canto: Yeah, okay – you get this messy complexity, all mixed with oil and vinegary acids and shite – you get this break-down into gunk, and that’s easy. What’s hard is to go in the other direction, to build up from gunk into a fully fledged chicken, or a handsomely finned shark. And that’s what these experiments were trying to do, in their small way. They were creating this primordial-soup-gunk and hoping, with a bit of experimental help, to spark life into it, and basically getting nowhere. The problem is essentially to do with randomness and order. How do we get order out of random complexity? It’s easy to go the other way, for example with explosions and machine guns and such. We see that everywhere. But building the kind of replicating order that you find even in mycoplasma, the smallest genus of bacteria, from scratch, and by chance – well, that’s mind-bogglingly improbable. Jacinta: So we have to think in terms of intermediate stages. Canto: Yes, well, there are big problems with that, too… But let’s give it a rest for now. Next time, we’ll discuss the RNA world that most biologists are convinced preceded and helped create the DNA world we live in.